It’s never a good idea to drink and drive, but sometimes, we understand you can get caught in an unwanted situation that you ultimately end up regretting. Nobody is perfect, and we all make mistakes — some of which are bigger than others. If you are being charged with a DUI or OVI, our DUI lawyers at Probst Law Office, Inc. in Columbus, Ohio can provide you with the effective representation you deserve. Contact us today for a free consultation. Here is your guide to understanding field sobriety tests, and how a DUI lawyer can assist you if you are charged with a DUI. Field sobriety tests are the roadside tests law enforcement officials conduct usually before a Breathalyzer test. Standardized Field Sobriety Tests were sanctioned in the mid-1970s by the National Highway Traffic Safety Administration (NHTSA) to help police determine the sobriety of an individual behind the wheel. There are also non-standardized field sobriety tests that aren’t specifically sanctioned by the NHTSA, but law enforcement officials will still utilize these tests during their DUI investigations. 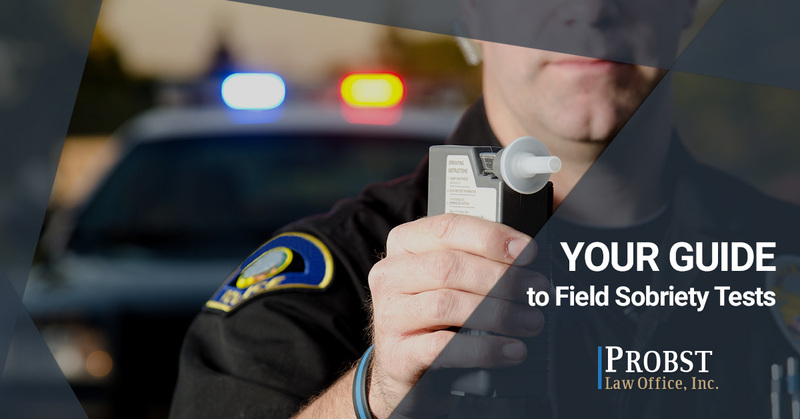 Below, we break down additional details that are relevant to both standardized and non-standardized field sobriety tests. What is a standardized FST? Standardized FSTs can help determine an individual’s sobriety of testing their specific responses or reflexes. These tests are scientifically validated in a court of law and can be used as evidence against you in court. An inability to smoothly follow a moving object. A distinct jerking of the eye when it is at its maximum deviation. A distinct jerking of the eye within 45-degrees of its center. This FST is used to determine if an individual has the ability to focus enough of their attention on one simple task. Officers will ask an individual to take nine heel-to-toe steps in a straight line, turn on one foot, then take nine heel-to-toe steps back in the opposite direction. The individual using their arms to balance. The individual putting their foot down on multiple occasions throughout the 30 seconds of counting. What is a non-standardized FST? Non-standardized field sobriety tests aren’t technically sanctioned by the NHTSA, but police officers will still use these tests as a means of determining whether or not an individual is under the influence when behind the wheel. These types of FSTs are not scientifically backed up by research in a court of law, and courts are less likely to accept a non-standardized FST as legitimate evidence. Requesting the individual to recite the alphabet. Requesting the individual to close one’s eyes and touch their nose with a finger. Requesting the individual to count backward. Requesting the individual to count the number of fingers an officer is holding up. Requesting the individual to tip their head back while standing with their feet together. What happens if you fail an FST? If you fail a field sobriety test, whether standardized or non-standardized, law enforcement might have a reason to charge and arrest you for driving under the influence. However, this doesn’t mean you should just give up and accept any consequences or punishments — you can still find a way to defend yourself. The best way to protect yourself is to hire an experienced DUI lawyer to help you with your case. For more information about DUI or OVI penalties in Ohio, learn more here. “What is the correct NHTSA procedure for conducting a field sobriety test? If law enforcement doesn’t follow this procedure, can they use an FST against me as evidence in court? Whatever other questions you may have about a DUI charge, our DUI lawyer at Probst Law Office will be more than happy to provide you with the assistance you need. If you refused a field sobriety test or failed one, our experienced DUI lawyer can help you with your case. Probst Law Office’s attorney Michael Probst can evaluate your situation and provide you with effective legal counsel. He has more than 14 years of experience as a prosecuting and defense attorney, and in the past, he has delivered successful results for many of his clients with DUI cases. Probst Law Office helps individuals in Franklin County and across Ohio, and we offer free consultations for first-time clients. Contact us today for your free consultation by calling (888) 223-3741 or by filling out our online form.